The decline of British power in Asia, from a high point in 1905, when Britain’s ally Japan vanquished the Russian Empire, apparently reducing the perceived threat that Russia posed to its influence in India and China, to the end of the twentieth century, when British power had dwindled to virtually nothing, is one of the most important themes in understanding the modern history of East and Southeast Asia. This book considers a range of issues that illustrate the significance and influence of the British Empire in Asia and the nature of Britain’s imperial decline. Subjects covered include the challenges posed by Germany and Japan during the First World War, British efforts at international co-operation in the interwar period, the British relationship with Korea and Japan in the wake of the Second World War, and the complicated path of decolonisation in Southeast Asia and Hong Kong. 1. 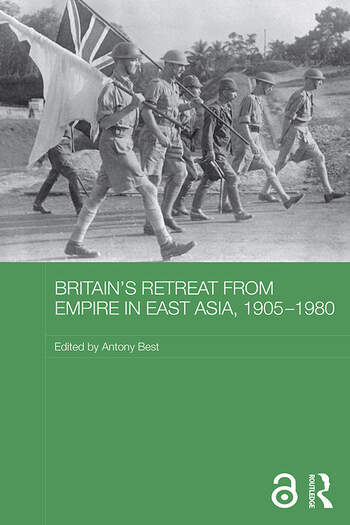 Early retirement: Britain’s retreat from Asia, 1905-23, Antony Best. 2. Imperial Germany's strategy in East and South-East Asia: The campaign against British India, Ian Nish. 3. Japan’s Twenty-One Demands and Anglo-Japanese relations: diplomatic negotiations and newspaper reports, T. G. Fraser. 4. Britain, intelligence and Japanese policy towards Siberia, 1917-22, Antony Best. 5. Britain, the League of Nations and Russian women refugees in China in the interwar period, Harumi Goto-Shibata. 6. Defending the Singapore strategy: Hankey’s Dominions’ tour 1934, Ann Trotter. 7. Conquering press: Coverage by The New York Times and The Manchester Guardian on the Allied occupation of Japan, 1945-1952, Roger Buckley. 8. In search of regional authority in South-East Asia: The improbable partnership of Lord Killearn and Malcolm MacDonald, 1946-48, A. J. Stockwell. 9. Anglo-American relations and the making and breaking of the Korean phase of the 1954 Geneva conference, Robert Barnes. 10. A withdrawal from Empire: Hong Kong-UK relations during the European Economic Community enlargement negotiations, 1960-63, David Clayton. 11. From Vietnam to Hong Kong: Britain, China and the everyday Cold War, 1965-67, Chi-kwan Mark. 12. Towards ‘a new Okinawa’ in the Indian Ocean: Diego Garcia and Anglo-American relations in the 1960s, Yoichi Kibata. Antony Best is an Associate Professor in International History at the London School of Economics, UK.